My good friend, Jackie, is freaking out. People can see posts on her wall and she doesn’t like it. Well, that’s not entirely true… she only wants her FRIENDS to see posts so she doesn’t pick up any stalkers. 😉 Does this sound like you? or maybe your friend? The easy answer is set your “Audience Selector” to “Friends (+friends of anyone tagged) And only post like that. If you don’t want MY friends reading the post. Don’t tag me. Otherwise you can just send me a message. Friends except Acquaintances is new. You may have noticed when you accept a friend request you can now list people as “Acquaintances” or “Friends” This will help you further filter who sees what. What I really like is that you can make groups or “Lists” so if you only want your family to see something, just select your family. You will have to make those lists. Facebook does do some suggesting for you which will help. When I share something, how do I choose who can see it? Before you post, look at the audience selector. Use the dropdown menu to choose who you want to share a post with. You’ll see this tool wherever you share content, whether it’s a status update or information on your profile (timeline). The tool remembers the audience you shared with the last time you posted something and uses the same audience when you share again unless you change it. For example, if you choose Public for a post, your next post will also be Public unless you change this audience when you post. 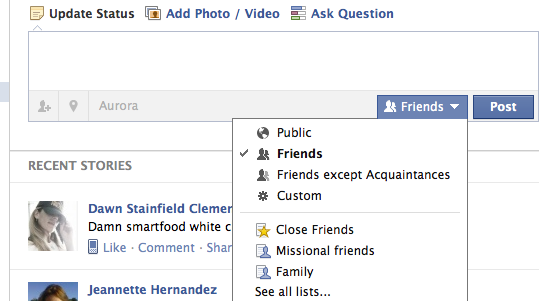 If you want to change who you’re sharing with, open the dropdown menu and choose a different audience. Remember: anyone you tag in a post, along with their friends, may see the post. To make it clear who you’re sharing with at all times, the audience you select appears along with whatever you are saying, every time you share. You can also use the audience selector to change who you are sharing with after you post something. **An added bonus! You can “bow out of conversations now by unfollowing post” YAY! Posted by bethkolar on October 12, 2011 in Facebook.